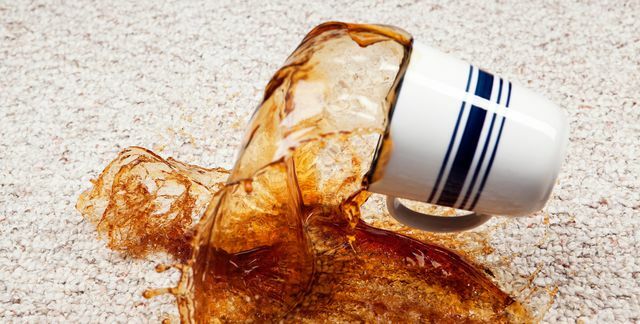 Coffee spills always happen at the most inconvenient time: as you’re running out the door, at the end of a long dinner party, or just when you finally sit down to curl up with a book. Good thing Carolyn Forte, director of the Good Housekeeping Institute Cleaning Lab, is here with advice on how to fight stains fast and get back to your life. The first step is making sure you have all of these essentials on hand! Now you can easily tackle stains on any of these common areas. If you’ve ever left your mug in the sink for a couple days, you know the struggle that is a stained ceramic cup. Forte says all you need is a Good Housekeeping Seal holder Mr. Clean Magic Eraser to wipe off marks. Or, if you don’t have one on hand, sprinkle some baking soda on top of your dish soap to add an extra oomph of abrasion and clean as usual. Sponge the stain with cool water or soak the garment in cool water for 30 minutes. Use a GH Seal holder Tide To Go Stain Pen to remove as much of the stain as possible, then pretreat with a prewash stain remover, like Resolve Stain Stick and launder as usual. If your coffee had milk or cream in it, make sure you use a detergent with enzymes in it that will help break down stains, like Tide Coldwater Clean Liquid Laundry Detergent. “Most stain-fighting detergents have enzymes, but check the packaging to make sure your brand does,” Forte says. Add chlorine bleach, if it’s safe for the fabric. Mix one tablespoon of liquid dish soap with two cups of cool water. Using a clean, white cloth, sponge the stain with the mixture. Repeat until the stain disappears, then sponge once more with cold water and blot dry. You can also try sponging the stain with dry-cleaning solvent. Blot until the solvent is absorbed and repeat until the stain disappears. Blot up as much of the coffee as you can. Then, mix one tablespoon of liquid dish soap, one tablespoon of white vinegar and two cups of warm water. Using a clean, white cloth, sponge the stain with the mixture. Apply a little bit at a time, blotting frequently with a dry cloth until the stain disappears. Finally, sponge with cold water and blot dry.